The Cambridge Candle - Register to Win! You have the opportunity to share in an amazing prize this fall. 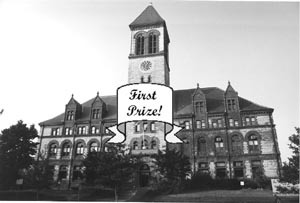 You will be one of the lucky winners in the City of Cambridge Sweepstakes! But you must register to win! (Click here for contest details). This contest is open to residents only, and you must be 18 years of age or older to participate. This is a high-stakes kind of game, where every entry counts! Cambridge City Hall (Photo by Marty Connor). Dont delay, register today for the November 2nd final round! Study the field of prospective candidates, carefully examine their agendas, affiliations and priorities, and prepare for the big game! Who you select this fall will have a big effect on what your home town looks like in the years to come! Choose wisely, and you can look forward to safer streets, better schools, breathable air, and less congestion on our roads and in our neighborhoods. Choose unwisely, and you can look forward to a cold, gray city, which looks something like a cross between a shopping mall and a dormitory, with strange tall buildings popping up in residential neighborhoods, and multi-story parking garages replacing gardens, parks, and green space. Entries in this contest are not transferable, which means that after you register, you and only you can appear at the polls to cast your ballot! This is a limited-time offer! Entries must be received by October 13, 1999 to be valid! I hope this article gives you a smile, but more than that, I hope it gets you thinking about what kind of city you want for yourself and your family, and about the importance of your participation in selecting good city council employees to represent us. Participation in government is what democracy is all about. I know it seems like a waste of time to some people -- look at the municipal election statistics for the last ten years (see our Having a Public Voice in Cambridge story) -- fewer and fewer people are participating in city elections. We need to change this trend. We need to stand up, figure out what kind of city we want for ourselves and our children, and hire people who will help us make it happen. We can do this! Cambridge is just six square miles, and if a small group of citizens like us, starting with no money and a dream can figure out how to publish a paper, distribute it, get advertising, and do it ethically and legally, then we as a city can come together and choose leaders that represent our desires, hopes, and ambitions. We can reclaim our city from those who would take it from us and extract great wealth for themselves in the process. We can insist that our concerns about quality of life are at the top of our citys agenda, and not somewhere on the list behind the wishes of commercial real-estate developers and the expansionist desires of non-tax-paying educational institutions. I challenge you to get in the game and play to win. Support candidates that represent your beliefs and priorities, and take back control of our city from speculative outside interests. Take the first step now. Register to vote. Our city is blessed with a dedicated Election Commission that wants you to exercise your right to vote. They make it easy and convenient. They are located at the Central Square T stop on the third floor of the Police Station building. You can call them at 617-349-4361 to get directions and information. Light your own candle this new year, and join with us in spreading light to every corner of our city. Together, we will all win.